Train capacity would be boosted by 10% into Sydney’s CBD and 16% into Central Station by terminating more trains at Central according to plans prepared for the NSW Government in 2014. The plans would seek to increase rail capacity by maximising the use of existing infrastructure rather than building new infrastructure. However, commuters from stations in Sydney’s West such as Penrith would see their trains terminating at Central’s Sydney Terminal, requiring them to change trains if they wish to continue their journey into the CBD.The changes come in the wake of warnings from the Auditor General that Sydney’s rail network requires additional investment to keep up with growing demand. The Sydney Metro CBD and Southwest will be the first increase in heavy rail capacity into the CBD since the 1979 opening of the Eastern Suburbs Line, but is not set to occur until the year 2024. 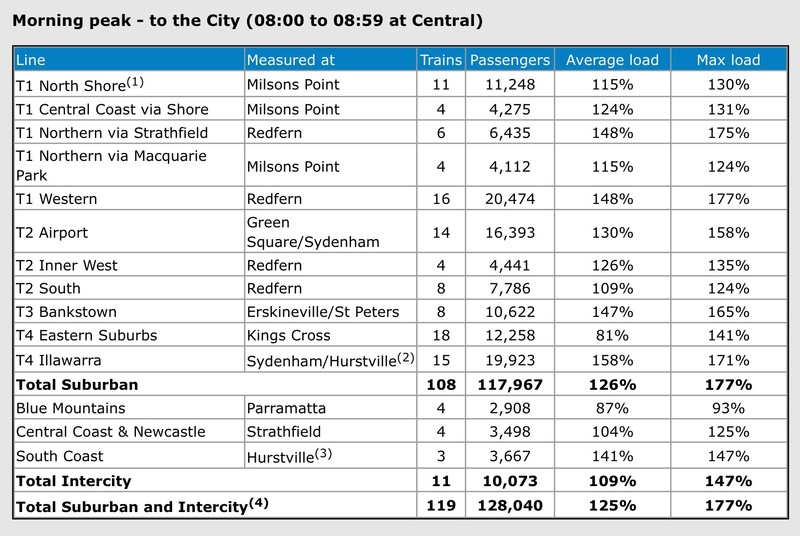 Performance data published by Sydney Trains indicates that the most crowded lines into the CBD are in order: the T4 Illawarra Line, T1 Northern Line, T1 Western Line, and T3 Bankstown Line. Each line has patronage during the busiest hour of the morning peak equal to between 147% and 158% of total seats. Crowding levels above 135% often result in delays as passengers struggle to enter and exit trains quickly at stations, resulting in fewer trains per hour and thus reducing total line capacity. The proposed changes would seek to alleviate pressure on each of these four lines. The T4 Illawarra Line would see an increase in TPH (trains per hour) from 18 to 20, the maximum possible under current signalling. The T1 Northern Line would see its capacity boosted via Strathfield from 10TPH to 15 TPH and eventually an increase in capacity via Chatswood when the Sydney Metro is extended to the CBD in 2024. The T1 Western Line would controversially see cuts to services West of St Marys, which would terminate at Central rather than continue on to the CBD, and on the Richmond Line, which would see a reduction in services from 6TPH to 5TPH. This would be offset by an increase in services between Parramatta and Central, from 20TPH to 26TPH, by extending the Inner West Line out to Parramatta. However, there would be no increase in the current 16TPH that continue past Central into the CBD. The T3 Bankstown Line would see a 25% increase in services, rising from 8TPH to 10TPH; further increasing to 15TPH in 2024 with the extension of Sydney Metro to Bankstown (albeit with a reduction in seated capacity). Other changes include lengthening some intercity trains from 8 carriages to 12 carriages, while a pair of peak hour train departing from Epping that currently run with 4 carriages could be doubled to 8 in order to further increase capacity. Together, the final effect of these changes could see capacity (measured in terms of the number of 8 carriage trains) of all lines during the busiest hour of the morning peak increased by 10.1% into the CBD, from 109 to 120 trains, and by 16.5% into Central Station, from 118 to 137.5 trains. Seeking ways to increase Sydney’s existing passenger rail capacity without having to resort to large investments into its infrastructure should be welcomed. This is something this blog has been calling for since 2013. While unlikely to be welcomed by those adversely affected, if implementing these proposed changes results in 16% or even 10% increases in capacity to the network overall then it will do a lot to get Sydney moving. The opposing perspective would argue that all main suburban lines deserve direct rail access into the CBD during peak hour without requiring passengers to change trains. Demoting parts of the Western Line to the same status as the Cumberland or Olympic Park Line sets a clear precedent. This argument contains valid concerns. Either way, infrastructure investment is still needed to cope with future increases in demand. The Auditor General’s report mentioned above found patronage had grown by 4.3% each year since 2011. At this rate, even a 16% increase in capacity would be absorbed by less than 4 years of patronage growth. This is why new infrastructure such as the 2 Sydney Metro Lines currently being touted cannot come soon enough. Unfortunately, the 2024 opening date for the CBD and Southwest stage of the first line is already too late to meet existing demand. This is why recent suggestions that a second metro line could be opened between Parramatta and the CBD in the mid 2020s should also be welcomed. Finally, it’s important to note is that these plans are both internal and old. 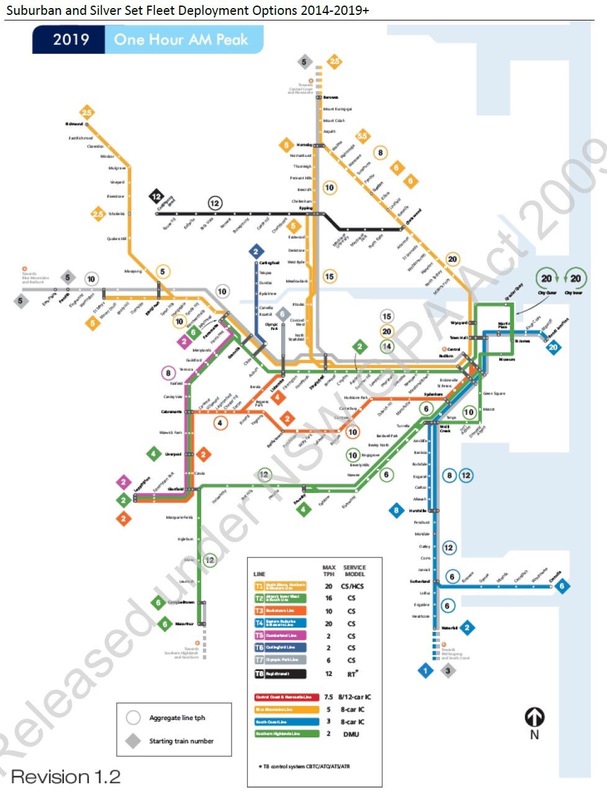 Many aspects already appear to be obsolete, such as the North Shore Line only running 18TPH (the current timetable operates 19TPH) or referring to the first Sydney Metro line as T8 (current government publications suggest it will be branded with an M rather than a T). The Transport Minister Andrew Constance himself raised this in an interview with the ABC. So treat this more as a guide than actual concrete plans or promises.